We just entered Mississippi and stopped at the Welcome Center for a restroom stop. 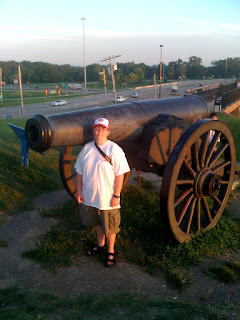 Across a pedestrian bridge from the parking lot is a cannon as part of the Vicksburg National Park. The hill the cannon is on gives a great view of the Mississippi River, especially with the sun setting right now.